Lingraphica staff members Faye Stillman, MS, CCC-SLP/ATP, Continuing Education Manager; Mary Anne Lang, MSN, RN, Clinical Marketing Manager; and Andrew Gomory, CEO took our presence at ATIA 2019 to the next level this year. We hosted a booth in the exhibit hall, which drew a crowd of more than 3,500 people—a new record for the conference! While at the booth, we made some great connections and were able to demonstrate what our AAC devices, apps, and online therapy can do for people with aphasia and other communication disorders. 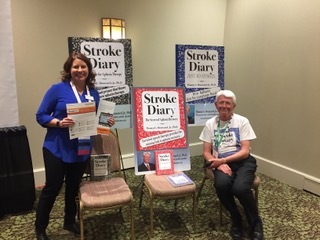 On Thursday during the conference, Stillman made a formal presentation with author and stroke survivor, Dr. Tom Broussard. The topic of the presentation was "Clinical Application of Assistive Technology for Experience-Dependent Neuroplasticity," which is an ASHA-approved CE course and available at no charge on our website. The audience for this presentation included SLPs, occupational therapists, physical therapists, and rehab engineers. At the end of the presentation, we fielded some great questions and had excellent engagement with the attendees. 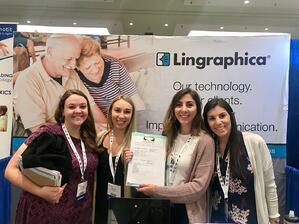 Lang presented Lingraphica's products on Friday to a group of attendees who were interested in our technology. After the 20-minute presentation, she answered questions and invited them to come to our booth for further discussion and hands-on demos. We had some special visitors to our booth on Saturday. SLP students enrolled in an AAC class at Nova Southeastern University were assigned to visit AAC vendor booths to learn about the variety of AAC tech that is available in the field. Several groups of students stopped by to ask questions about our technology, took notes as we shared with them, and took home collateral about Lingraphica's offerings. ATIA 2019 was a great time of catching up with old friends and making new connections! We look forward to seeing everyone again in 2020! If you have any questions about our AAC devices, apps, or online therapy, contact us!